How about a patchwork tutorial for a scrappy quilt block? Here’s one I’ve been playing with over the past few days called Feeling Cross. After my 13 yr old and I couldn’t come up with a name I figured Feeling Cross was apt and left it at that! If you’d like a PDF copy of this scrappy quilt block pattern, just fill in the fields below and it will be automatically emailed to you. Here’s what you’ll need to make one 9.5″ (unfinished) block. Once sewn into a quilt, the block will measure 9″. Take the 4 dark blue squares and match them with 4 green squares to make 8 HSTs. Press toward the darker fabric and trim to 2.5″. 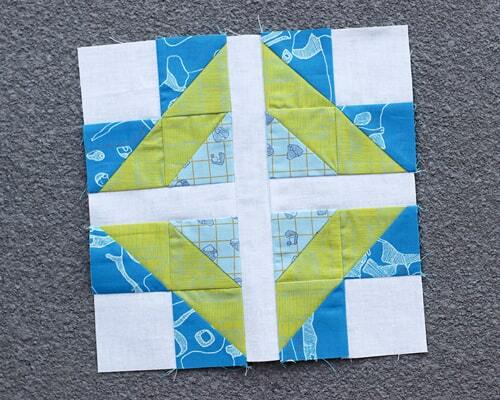 Then take the two light blue squares and match with the remaining 2 green squares to make 4 HSTs. Press toward the darker fabric and trim to 2.5″. The arrows on the blocks above show the seam pressing directions, so that the seams will nest within the four-patch. I think these blocks make a great scrappy quilt when joined with sashing (and the bonus when using sashing is you don’t have to press your seams a particular way to ensure the blocks nest). The sashing in the version above is cut at 1.5″ wide to finish at 1″. I’ve used the same three colours in my blocks, just rotating them through each position in the block to give a point of difference. A 4 x 5 block layout like the one above would give a 41.5″ x 51.5″ crib quilt. If you make one of these blocks (or your own scrappy quilt), make sure you let me know! Thanks Cynthia, best of luck with your quilting adventures! This looks great! I’ve been looking for a block to do a ‘repeat’ on with scraps. Thanks! This is another lovely quilt block and pattern Kristy. I thought I should mention that months ago I tried to order patterns from your site and it wouldn’t work for me. I don’t know why. Hi Lisa, so glad to hear you like the block, but not happy to hear you had trouble ordering! If you ever decide to try again and have trouble, please don’t hesitate to drop me a line so I can see if I can get to the bottom of it. Please send me the PDF of this pattern. Finally, a designer has noticed the “Naming” thing and made a comment about it. If I have asked my darling husband once I have asked 100 times ” Do you see any thing in this quilt that makes you think or feel _______? ( think of biscuts or feel like going to the beach?) Naming a quilt is like naming a baby. The name will always be there so I can relate. But it can be just as fun as it is hard….so thanks for expressing what you go through. Isn’t it the hardest thing? I used to wonder why sometimes artists call their paintings Still Life Study No. 1 or Landscape 36. Now I know. I’m thinking Quilt No.44 sounds just right! Thank you for the pattern. I think a grandson will enjoy this. This is such a cool block. It can look so different by just changing out the colors. Thank you for sharing the pattern. I like the motion the block has. Thank you for linking up with the Tips and Tutorials Festival!